Hi and thanks for visiting my blog. I’ve been having a bit of time off this month after several hectic months of constant work. 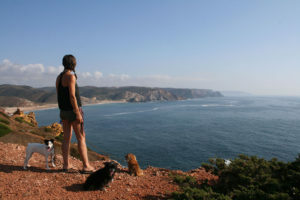 Over my birthday we took off in the motorhome again for Portugal and have been enjoying mostly the beaches here. Deciding to do a bit less work this month, I also planned on working on a personal project. Getting back to some wildlife and landscapes has been on my to-do list for a while. 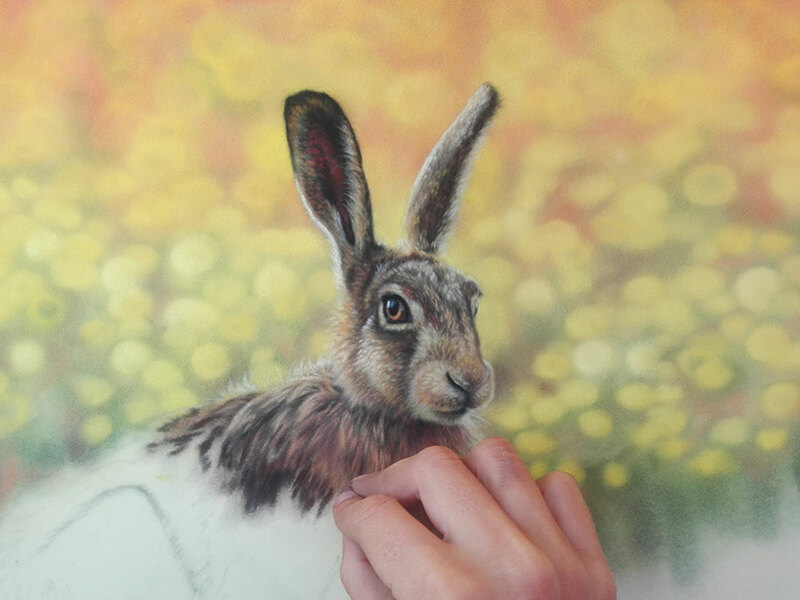 I hope you enjoy the progress of my buttercup hare. 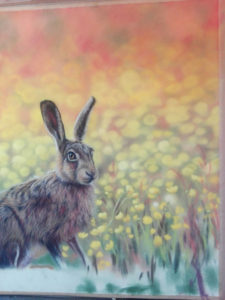 As I write this blog I haven’t yet named the painting, so maybe you can help suggest something. 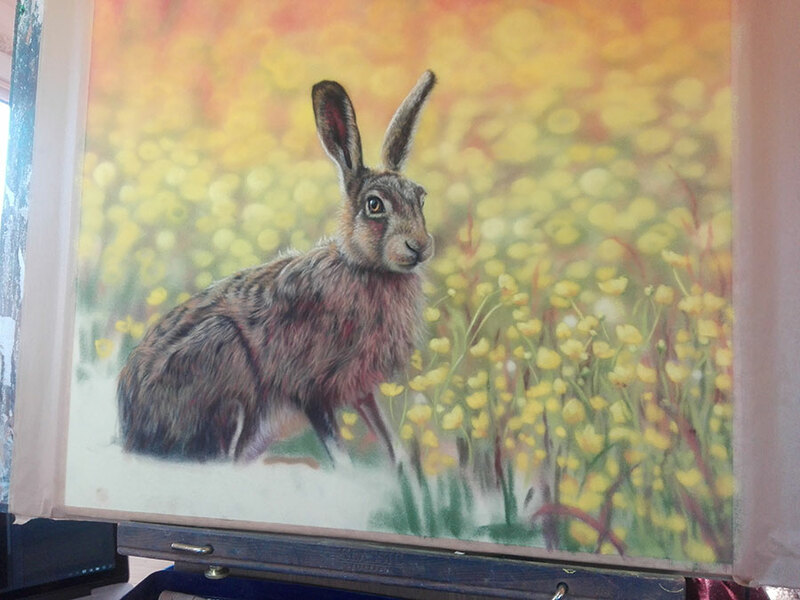 The reference photo (cropped a little from it’s original shape as I was focusing on the hare) My next task was to produce my layout and then my line drawing for the hare. I didn’t need to draw any of the surroundings but I did want to have the hare a particular size within the piece. So I drew out a 2″ grid to ensure I got my proportions accurately. You can watch me draw it out in the video below. 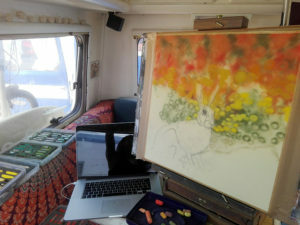 I get my line drawing onto the velour pastel paper and begin work on the background. 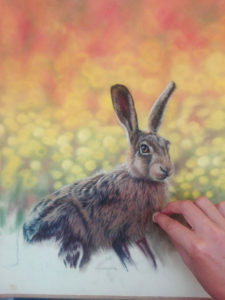 When I get the background to a certain stage I begin working on the hare. 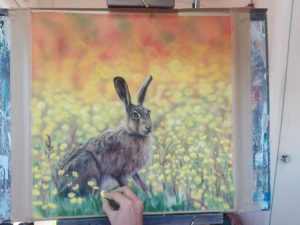 I like to work it all together so that I can make use of the background palette in the hare’s coat. 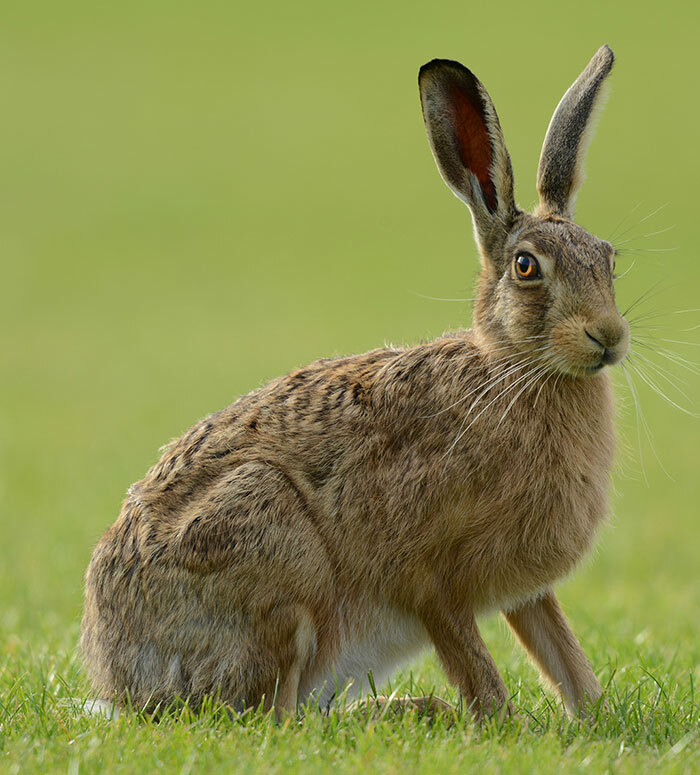 This ties the two together and makes it seem as if the hare is reflecting it’s surroundings. Although the piece is quite big, the hare’s face is small within the composition. I have to use sharp pieces of pastel and some pastel pencil to get the smaller hairs and details. The hare itself will make up next month’s tutorials on my Patreon channel if you’re interested in learning my techniques. 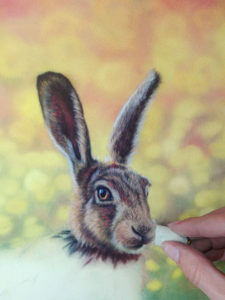 You can visit my page and subscribe for a very small amount at www.patreon.com/emmacolbertart. Each month I put a lot of work into creating tutorials showing exactly how I produce my work. Thanks to around 175 Patrons there now, I’m able to devote a little more time to creating these tutorials and investing in better equipment to improve quality. This month however, I’ve managed to take a little time to enjoy some of Portugal’s Algarve coastline. 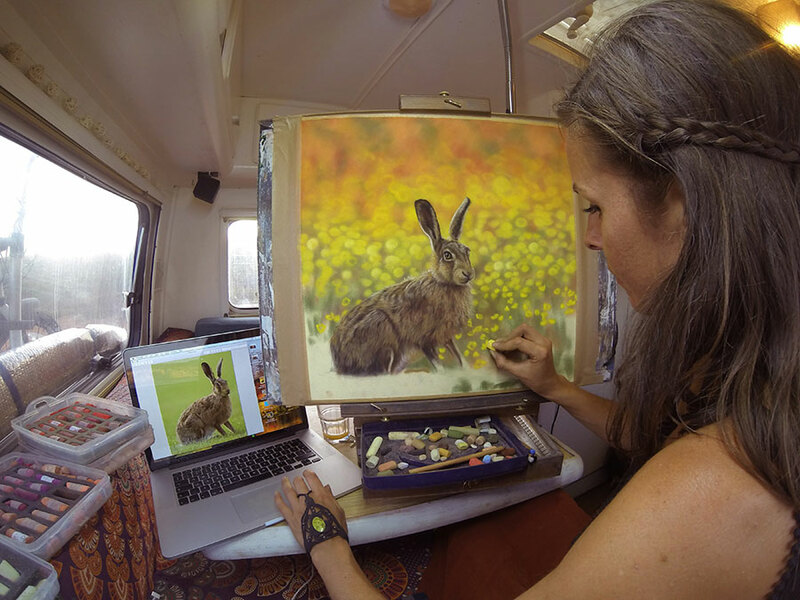 The dogs have been loving being back in the van, and even though it’s more work to set up my studio each day, I love the perks of have a studio on wheels! The three pups are out in the van together for the first time. 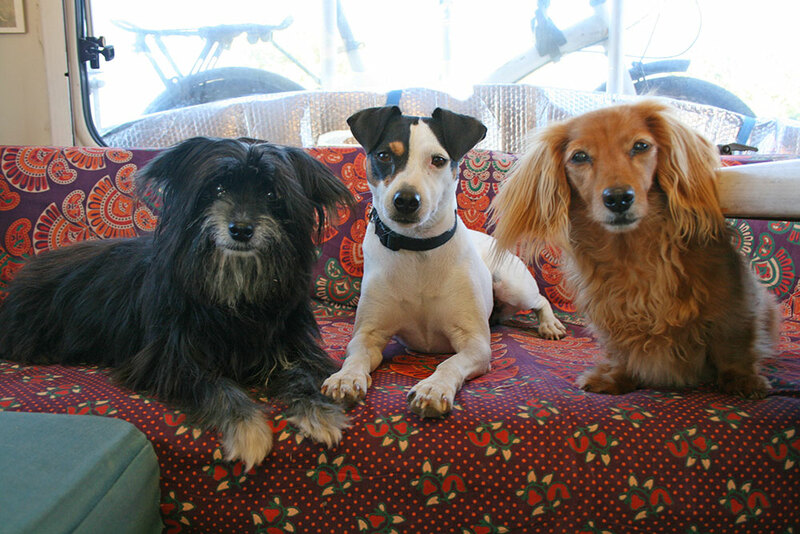 So far, it’s not much different to having two dogs in here…which wasn’t much different to having one dog! Thankfully they’re small. We see people with large dogs in tiny vans all the time! 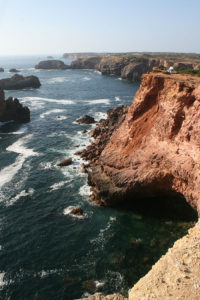 The rocks and cliffs here really remind me of some of the Irish coastlines. I thought this VW camper found a pretty good spot for the evening! 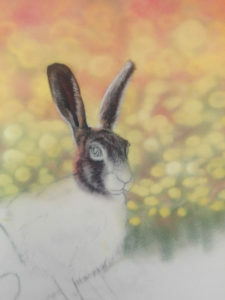 Back on my hare, and I begin to work on down the body. 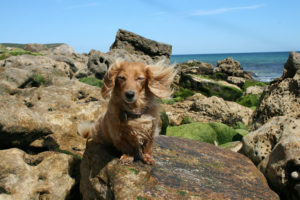 I have my colours out around me from the face, it’s just a matter of mapping out all that fur as it flows over the muscles. I love the cosiness of my motorhome studio. I’m filming too which makes things a little extra cramped. But once I’m in and working it’s quite comfortable. I always have room for pastel trays around me and good ventilation in this area with roof vents and large windows. 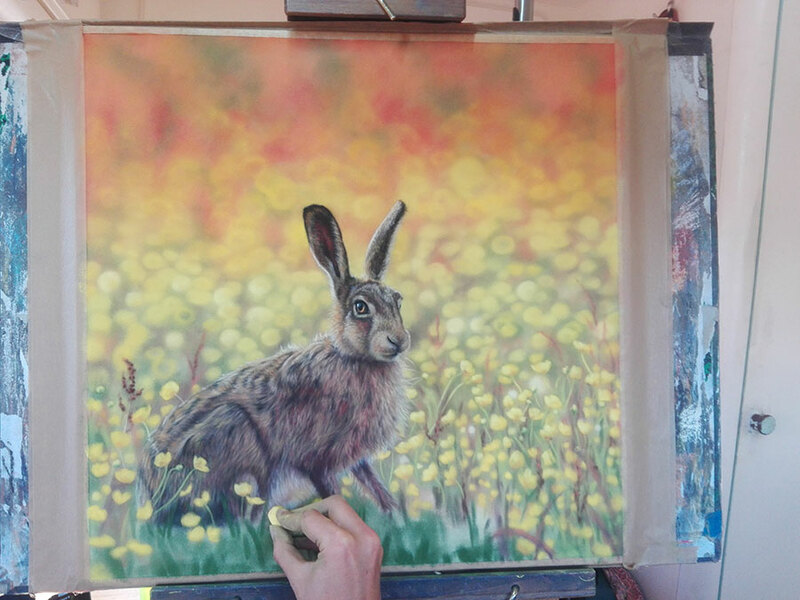 Starting work on the foreground now and I have a lot of work to do to make the hare sit naturally. I’m working mostly from imagination on this but also looking at my older paintings in this series. 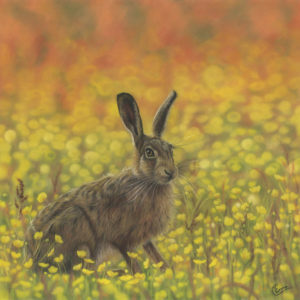 I try to keep the buttercups around the hare in focus and blur everything else. On the home stretch now. Those all important buttercups which will make the hare look grounded, then a few whiskers and I’ll be done. Thanks for visiting, I hope you enjoyed seeing this piece come together. The original will be available to purchase soon, as will limited edition prints. If you’d like more details please get in touch. I have a passion for hares! This is absolutely lovely, Emma.